When you travel overseas to Eastern or South Asia, you really need to get comfortable with the idea that you are going to be on an airplane for a very long time. Being on an Emirates A380 in Business Class makes the journey a whole-lot smoother, that’s for sure. I thought back to some of my longest flights. Dubai is about half-an-hour longer than flying to Tokyo, but not nearly as long as a flight to Hong Kong. When I flew to Taiwan via Hong Kong, Cathay Pacific was still running A340s with a stop-over in Anchorage. On that flight, I just put my watch away and devised a method of determining flight time by how many times the in-flight multichannel entertainment loop had gone around. Pirates of the Carribean Dead Man’s Chest was the longest running channel on the loop at 2.5 hours, so I knew by the 4th time through that I was 10 hours into the flight. My colleague and I had settled into our seats on our Emirates A380 in Business Class. He had talked me into forgoing my Star Alliance or OneWorld points to take a taste of this experience. This plane is a huge bird. I was also amazed at the number of business class seats: 76, with another 14 in the First Class cabin, all on the top level of the plane. As I was remarking at its length, peering down the aisle, I noticed an attendant walking down from the front of the plane. Walking from the front, gracefully but with intent, she stopped at my colleague’s seat to welcome him on-board, thank him for his continued patronage, and extended an offer of any manner of assistance during the flight. I almost fell over in my seat. I had never experienced anything on a North American airline – such a simple gesture. The Emirates A380 business class seat and layout is impressive, and most reviews echo my first impressions. The seats are staggered to create a mini-bar, and a ledge for your stuff. 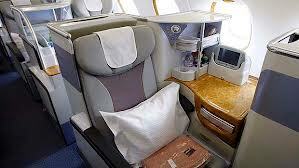 The seats offer a good width and the business class pod does not feel cramped, and offers a good amount of privacy. The seats lay perfectly flat for sleeping, and the attendants bring you a thin mattress to help make your slumber more comfortable – this was a nice touch. The seats configured to be closest to the window are unanimously favoured as they offer more privacy. Privacy is a desirable attribute for me if you read my other entries. The Emerati have styled the cabin for “luxury” which means lacquered wood panels and somewhat aristocratic faux-finishes. It’s very nice, but not my familiar experience. Personally, I prefer the sleek modern interiors, like the new BA 787 Dreamliner. The screen and entertainment unit is impressively big – they occupied all available space to outfit a 19-inch touch-screen display – the largest I have ever seen in a business class cabin. The entertainment system also offers a separate touch screen controller, which I never found occasion to use on the couple times I flew Emirates. Emriates has won many awards for their in-flight entertainment offerings, which includes nose and tail-mounted cameras to watch real-time video feeds on the display. The mini-bar area provided a neat place to store my drinks, but considering any drink you wanted, at any time, was readily available, it kinda made the concept of a mini-bar at your seat a bit unnecessary. Not to mention the full bar at the rear of the cabin. There is both a regular meal tray, and a drink tray that extend – the meal tray is comfortable when using a laptop, and the power receptacle is easily accessible. The bar at the rear of the business class cabin is a communal area, and featured prominently as part of the luxurious experience Emirates tries to create. It is well stocked. The first time I ever had Champagne with Creme de Cassis was at this bar, which has since become a summer-time favourite of mine when entertaining. It’s nice to have a space to go other than your seat on these long flights. And, inevitably, you will meet somebody interesting. I talked at length with a free-spirited Accountant from Calgary who occasionally taught accounting certification courses in Dubai. The food is above average but I wouldn’t say I eagerly anticipate the snacks and sandwiches they provide there – although I must admit they have the best variety I’ve experienced. I found another really comprehensive description on this blog, too. Check it out. Terminal 3 in Dubai is quite an impressive feat of civil engineering. It’s large and modern, albeit crowded. The crowds underscored a thought I had while reflecting on the in-flight experience: Emirates is gunning to be the airline for connections between Europe, Africa and Asia. This was a huge hub, and it was connecting everywhere. There was a trade dispute between Canada and the UAE a few years back over gate slots in Toronto. And, all I could think of was that Air Canada ought to try something more than protectionist measures to stave off competition from Emirates, for their profitable Frankfurt flights, which connects to Africa, the Middle East and India via Lufthansa. Maybe like: better customer service. Emirates is clearly an upstart with focus and solid backing, and a pretty good Premiere League Football club to boot. It will be interesting to see the future with these guys. The bottom-line: You will not be disappointed, and it probably will be cheaper than your other business class alternatives, too. Forget the points for at least one trip, and spend a few-days in Dubai en-route.